Our high quality, reliable roofing knives will ensure that you’ll spend more time on the roof than out trying to find a replacement blade. We have knives specifically designed as shingle cutters, heavy-duty non-retractable utility knives, angle knives, and many more types of utility knives, perfectly suited for your roofing needs. Our AJC Guardian Angle knife is the quintessential shingle cutter offering precision, versatility and much more. The AJC retractable knife with a heavy duty die cast handle is the industry’s standard when it comes to a basic knife that you will grow to depend on. 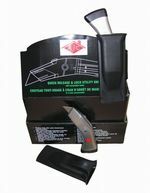 If you’re looking for a roofing knife that is even tougher than that, try the heavy-duty non-retractable utility knife. Have a question for us? No problem! Contact us at any time – we are here to help! A real time and knuckle saver! Specifically designed for cutting shingles, our Guardian Angle™ Knife comes complete with AJC’s Big Hook, Bowtie, and standard Utility Blade. This roofing knife features hand and knuckle protection and the ergonomically superior design reduces fatigue and increases leverage. Retractable blade, red enamel finish utility knife. Button projects and retracts blade to three positions: Full, half, and one-quarter out. Heavy duty die-cast handle provides blade storage. Uses 031-453R Knife Sheath. Heavy duty aluminum alloy utility knife. Die-cast in two sections provides blade storage. Has handy hang hole. Comes with one blade. Uses 031-453R Knife Sheath. Angled roofing knife to keep hand away from work. Especially good with our 059-HB5 Hook Blade. Remove cap and spread handle apart to change blade. One extra utility blade stored in handle. Uses 102-419 Knife Sheath. The AJC retractable quick change knife is now available with a holster. No tools required to change blades! The super heavy duty, all metal, ergonomic handle provides control and comfort. The AJC Tools insulation knife is specifically designed cutting roofing and poly iso insulation. This insulation knife features a spring tempered steel blade and ergonomic grip.